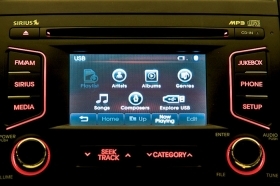 An earlier version of the Microsoft system is used by Kia in its Uvo voice-activated technology. Microsoft Corp. is angling for more automotive customers with a new version of Windows for the car, a move seen as reaffirming its commitment to the auto industry. Last week the technology giant released Windows Embedded Automotive 7, which it says is about three generations ahead of the Microsoft software found in the original 2007 version of Ford Motor Co.'s Sync entertainment and information service. The company says the latest software provides improved speech recognition; more options for sending text messages by voice; and more features to help car engineers get new technologies to market faster. "All that's left for the carmaker, or their supplier, is the work of adapting it for a particular vehicle or a particular device in the vehicle," Walter Sullivan, a senior program manager for Microsoft, told Automotive News. Also included is a version of Microsoft Silverlight for creating richer graphics. Silverlight, a competitor of Adobe System Inc.'s Flash software, is used to add animation and multimedia functions to Web sites. Sullivan said Microsoft's aim is to speed up the pace of automotive technology introductions. "Automotive systems traditionally take quite a while to develop -- anywhere from 18 months to three years," he said. "The complexity of the systems is substantial, and the amount of testing ... that they go through with these systems requires a significant engineering cycle." Slightly older versions of Microsoft's software are in Ford's Sync, Kia Motors Corp.'s Uvo voice-activated technology and in a similar system for Fiat S.p.A. called Blue&Me. Nissan also uses Windows in the touch screen "information hub" on the Leaf electric sedan. "Microsoft continues to invest in an automotive-specific platform," said Gartner Inc. analyst Thilo Koslowski. "There was some concern over the last probably six months that the company was somewhat de-emphasizing the automotive commitment because there has been some personnel change and also some organizational changes." About a year ago, the software platform, once known as Microsoft Auto, moved from the company's Automotive Business Unit to Windows Embedded, a division that produces operating systems for devices such as portable music players. Separately, a group pushing for an open-source infotainment software platform said it has signed up its seventh and eighth automaker members. Jaguar Land Rover and SAIC Motor Passenger Vehicle Co. of China, have joined the Genivi Alliance, whose open-source software is a potential rival to Microsoft's proprietary software. Others in the Genivi Alliance include General Motors Co., BMW AG, Nissan Motor Co. and Renault SA. The group is focusing on developing "middleware" -- the layer of software that allows various kinds of information and entertainment applications to work together in the car. Middleware controls such functions as encoding audio and video signals and managing power use.